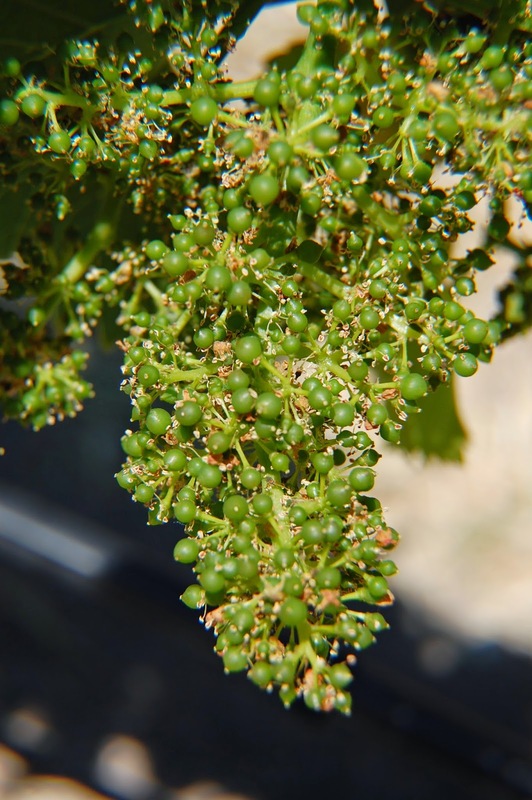 Growing Season Timing: The dates of bud break (first opening of buds into leaves) and flowering are good indications of whether the growing season is early, normal or late. Syrah and Grenache plants were at 50% flowering two weeks ago 5/07/14. This is approximately 3 weeks earlier than normal for the past 5 years. Right now, these same Syrah and Grenache vines have reached fruit set which is when the grape flower has been pollinated and now forms a tiny berry. An indication of the degree of fruit set is what percentage of the flowers have turned into berries. State of the Canopy: The early red varieties of red wine grapes, Syrah and Grenache have reached nearly full canopy size and objectively(tongue in cheek) the canopy looks wonderfully healthy. The later red wine grape varietals in our vineyard, Tempranillo and Mourvedre, are normally about 2-3 weeks later and need a few weeks for the canopy to fully expand. Flowering in these varietals has progressed nicely. Water: The growing season has been wonderfully cool, leading to less need to irrigate and vines with almost no exposure to heat stress at this time. Last year, we started honey bee keeping and have become aware that many man-made chemicals applied to vineyards are very toxic to bees. So, a year ago, we stopped utilizing chemical fungicides in the vineyard. As a result, all of our powdery mildew sprays are natural materials such as stylett oil, sulfur and etc. More on the (etc.) and bees in a later writing. Future Weeks: Next in the vineyard, these new berries need to grow to full size. The period for cell division growth in the grape berry is about 6 weeks. This is a critical period in the development of a berry as it is the largest factor determining berry size which we like to be as small as practical. The smaller the berry is larger the berry surface area/volume ratio becomes. The large surface area/volume ratio leads to increasing influence of berry skin vs berry pulp on the characteristics of the fruit and increased concentration of the fruit at harvest. Conclusion: So If this temperate weather continues, I am looking forward to a banner growing season with much room for the extended hang time required to get each varietal to optimum ripeness. Our Secret Craving? It’s a deep, ruby-colored wine…a mellow yet dramatic performance starring three distinct beauties: Cab Fanc, Syrah and Merlot. Plucked from the rich soil of Paso Robles, the grapes that wrote the script for this unique ensemble deliver an engaging deep fruit and blueberry performance. Subtly sweet and gracefully bold, this hush-hush concoction speaks of its passions through flavors of cassis, leather and spice. Sip it, pair it, chill it, air it…and each time, it will provide you with an experience more unique than the last. It’s the very evidence of intrique and the very magic of science, all at once. On a breezy, sunny Sunday this past weekend, Secret Craving was poured at a secret tasting on LXV winery property in Paso Robles, greeted by the eyes, noses and palates of a select few “suitors” who could not wait to meet LXV’s (and winemaker Amy Butler’s) latest work of winemaking art. Surrounded by barn wood, vines, crystal chandeliers, homemade international cuisine and superb company, lucky wine-lovers basked in the glow of this chic rural hideaway as it created the perfect balance between a simple backdrop and a complex, agile wine. 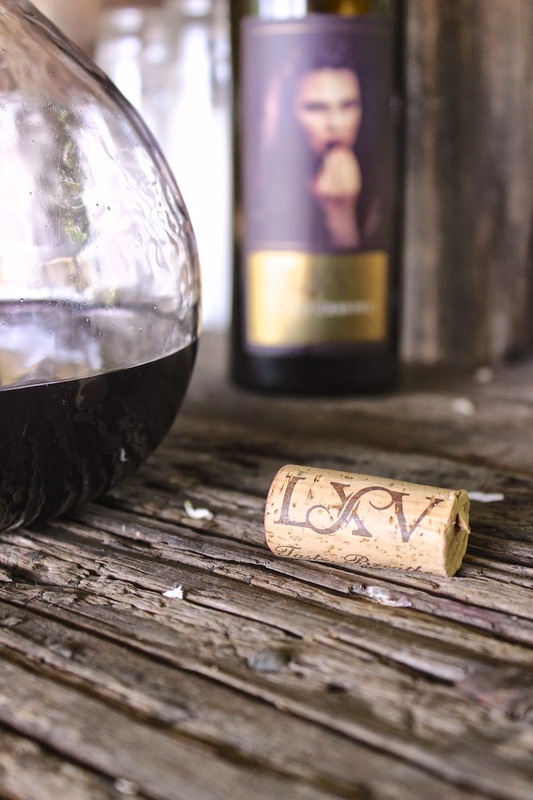 If you can’t bear to leave this Secret Craving unsatiated a moment longer, we invite you to a mysteriously riveting and whimsically indulgent tasting this Saturday, May 24, 7-9:30PM at the rustically elegant LXV property. On-location at LXV, world-renowned LA magician David Minkin will conjure an exclusive, private magic show for an intimate group of spectators, to their delight and amazement. Directions: 101 - 46W exit, Head West on 46. Turn Right on Vineyard Drive. After 0.8 miles, second right on Willow CreekRoad. 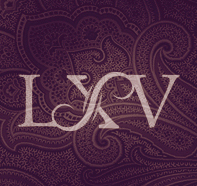 After 0.5 miles, just after Changala Winery, you will see a board for LXV. Parking: Plenty of parking on Willow Creek and in front of the house. Purchase at: http://lxvwineandmagic.brownpapertickets.com/ or call Neeta at 530-763-3821. Dress: Relaxed cocktail - (Dressy but no tie necessary). This is an outdoor event, so please wear comfortable shoes and bring a light sweater. Bites from Neeta’s Indian kitchen, served on the patio with live music featuring, Of Wind & Waves.